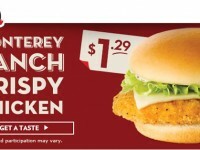 I dropped by Wendy’s for lunch and was reminded of a new sandwich called the Crispy Dill Chicken Sandwich. I am a lover of dill pickles (the more dill, the better), and the price was right on this sandwich, so I decided to give it a try. It only cost $1.49, and is available on the value menu. The Crispy Dill Chicken is a pickle lover’s dream. Piled high with crunch dill pickles and topped with refreshing cucumber dill sauce. Just looking at this sandwich and you see how it is loaded with pickles. The sauce you see is the dill cucumber sauce that has a great, dill flavor. 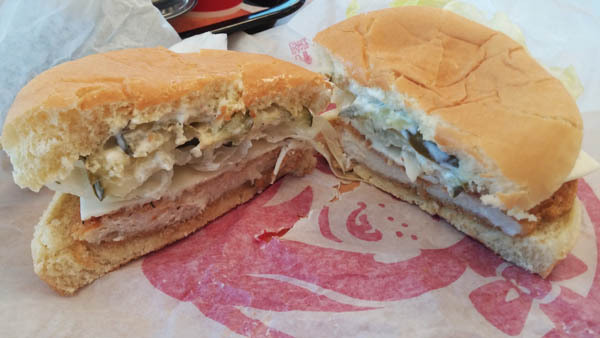 Overall, the top layer of dill pickles and sauce is the real hero of this sandwich. The pickles aren’t as crunchy as I would have hoped, as they are somewhat soggy sitting in the sauce. The major crunch comes from the lettuce. My only real complaint is with the lettuce. It seemed to be awkwardly shaped and didn’t really fit in the sandwich. 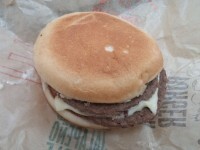 It does have a nice crunch, but as you can see, it is sticking halfway out of the sandwich. 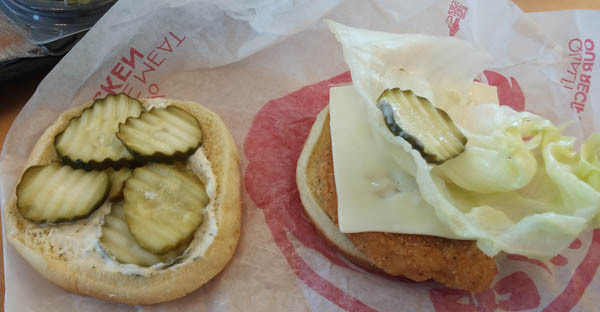 This isn’t just a problem with the Crispy Dill Chicken Sandwich, but pretty much with all Wendy’s value menu items that have lettuce. The piece of chicken uses is the standard, value chicken that is used on all value menu chicken items. 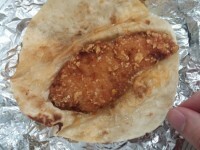 The breading and spices are nice, but overall there isn’t much to it. The flavor of the pickles/sauce overpowers everything else, so I felt the chicken didn’t stand out much. The single slice of Monterey Jack cheese didn’t add a whole lot of flavor, but it was a nice smooth texture, again, it was over-powered. Overall, being the huge pickle fan that I am, this sandwich did not disappoint. I loved the overall flavor and I would order it again due to the price. I think $1.49 is right on the mark, but any increase wouldn’t make it worth it. 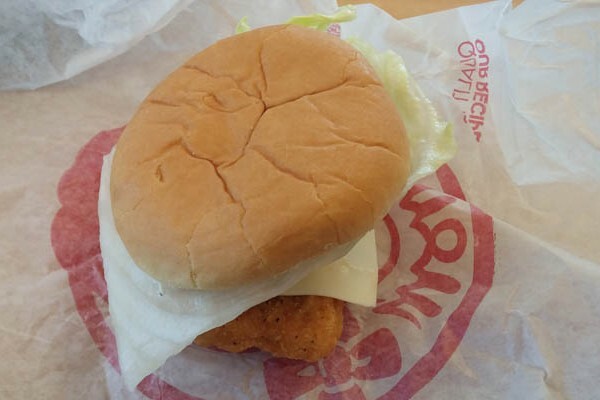 All things considered, I feel like the Crispy Dill Chicken Sandwich was a solid limited time addition to the value menu. The quality and flavor of ingredients won’t rival the more expensive sandwiches, so if you are expecting an amazing new chicken sandwich, you will be disappointed. As a value menu item, I felt Wendy’s was right on the mark, and that is the reason why I have this higher grade.